Bucky Covington took the same path to country music that was taken by Carrie Underwood, Kellie Pickler , Scotty McCreery and Casey James. Bucky, like the others, started on the stage of American Idol. He finished in eighth place during season five. Things started out good for Bucky. He was recording for Lyric Street Records, and his debut album was produced by Mark Miller, lead singer for the band Sawyer Brown. But, before Bucky had a chance to get his second studio album on store shelves, Lyric Street Records closed their doors, leaving him without a label for several years. Now on the roster of Entertainment One Music Group, he is recording for eOne Records, and released his sophomore album, “Good Guys,” this past September. His first single from the new CD, “I Wanna Be That Feeling,” didn’t do as well as the singer would have hoped, making it only to the number 57 spot on country music charts. There are a lot of really good songs on the new album, and hopefully, Bucky and his management team will find one that works for country radio. The 12 songs on the “Good Guys” album are I Wanna Be That Feeling, I’m Alright, Hold a Woman, Drinkin’ Side of Country (a duet with Shooter Jennings), Only Got So Much Time, Mama Must Be Prayin’, Sail On, I Always Said You’d Be Back, Mexicoma, I Want My Life Back, Gotta Be Somebody, and A Father’s Love (The Only Way He Knew How). The music on this album is a nice mix of 70s country music coupled with a contemporary radio-ready feel. This project for Bucky definitely puts the old with the new. “I’m Alright” is slow, and it’s good – it tells a story. Bucky’s vocals seem to be just the right sound for this song. That one is followed by “Hold a Woman.” I’m not sure where that ‘raspy’ voice came from – this, too, is a great song for Bucky. He pairs up with Shooter Jennings, son of legendary country Waylon Jennings, on the song “Drinkin’ Side of Country”. Kellie Pickler has a part in the music video for this song, which Bucky co-wrote with his brother/drummer, Rocky. “Drinkin’ Side of Country” sounds like so many of the songs we are hearing on country radio these days, so I’m really not sure why it didn’t the air time I feel it deserved. “Only Got So Much Time” is pretty much the story of everyone’s life. It puts you in mind of songs like “You’re Gonna Miss This,” or “Don’t Miss your Life,” and even Tim McGraw’s “Live Like You Were Dying.” While the words and thoughts are definitely different from those other songs, the message is simple….life is short, we only have so much time, use it wisely. “Mamma Must Be Praying, the sixth song on the album, is a fast song with a familiar melody. When I first heard it, I knew it reminded me of something else, but I have no idea what. It’s not one of my favorite songs on this CD, but I don’t dislike it either. For people who like a sad and depressing song every now and then, Bucky has one of those for you with “Sail On.” It’s a typical country break-up song, but it’s a pretty song. He follows that one with “I Always Said You’d Be Back,” which will get you back in a happy mood. What Bucky did her was follow the break-up song with a ‘you’re back’ song. This one is fun to listen to. “Mexicoma” starts with the feel of a mariachi band, a little brass, a little fun… a little bit of ‘this makes me want to jump on a plane and take a vacation.’ It’s a good song, it’s everything you might expect from a ‘let’s go to Mexico, sit on the beach, and drink Tequila’ song. That brings us to “I Want My Life Back.” and we’re back to slow, a little bit depressing, a little sad… but one of my absolute favorites on this album. The 11th song is called “Gotta Be Somebody,” and you might remember hearing this song before. It was the first official single released by Nickelback from their sixth album, Dark Horse, back in 2008. All I have to say about this is I believe Bucky’s version of the song is much better. It ended up being one of my favorites on the CD. 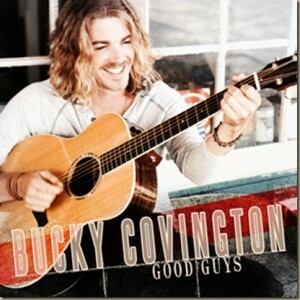 You can keep up with Bucky, and listen to some of his music, by visiting his web site http://buckycovington.com/. And, you can keep up with everything country by visiting ours at www.countryschatter.com. Follow us on Twitter, too, @countryschatter. MusicChartsMagazine.com (USA) – The Pulse of Music – Music News around the World!